Brandes Formula is a patented, natural herbal supplement that supports the immune system, and helps to cleanse the liver and kidneys. Horses metabolize protein more efficiently, look and feel incredibly well, have great energy and recover quickly from exertion, stress and illness. 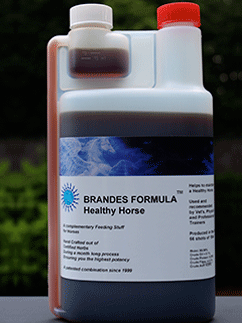 The components of Brandes Formula provide support to many systems in the equine body. Milk Thistle, Viola Tricolor and Heartsease all support the liver and kidney functioning. Garlic and Walnut support intestinal health and promote healing in the digestive tract. Hormone production is regulated and the body utilizes glucose more efficiently, meaning more energy for a better athletic performance. Echinacea fights bacteria and helps cells recuperate from damage. Cat's Claw has anti-oxidant properties that can protect cells from further damage. Regulating the digestive system: Some herbs help stimulate the muscles in the gut to increase the absorption of nutrients. This supplies the body with more energy and promotes optimum growth. Other herbs can correct bacterial disorders in the gut — following infection or the use of antibiotics — as well as improve cleansing. Protecting the liver: The liver works to detoxify the body, particularly during times of stress and infection, when waste and toxin levels are high. This in turn suppresses the immune system. Herbs can help to protect and stimulate the liver during times of heavy stress, offering maximum protection when the body is most vulnerable. Extra energy: Some herbs help to boost energy within the body by stimulating the metabolism of carbohydrate in the liver. This in turn promotes the release of enzymes and hormones that assist all the processes within the body that are vital for good health. A healthy, balanced body will have more energy because it wastes no resources fighting infection and disease. Resistance to stress: Physical and mental stress both produce poisons that attack the body causing exhaustion and a poor immune system, among many other problems. Herbs have been long used to combat the physical, biological and chemical effects of stress, thus improving the body’s resistance to the stresses placed upon it. What will Brandes Formula do for my horse? Support for the kidney, liver and digestive systems to improve well being and performance. Acts as a preventative measure against illness and infection- contains anti-fungal and anti-bacterial ingredients. Facilitates faster healing and recovery from competition, illness or high stress. Boosts fertility rates in mares and stallions. $140.oo Click here to contact us for introductory rates!